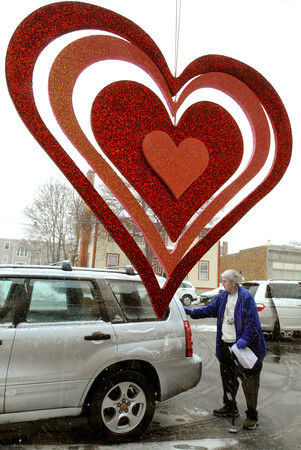 Ken Yuszkus/Staff photo: BEVERLY: Roz Rideout of Beverly removes the wet snow from her car after purchasing chocolates at Winfrey's Fudge & Chocolates. The heart decoration was one of many in the window of the store. The snowstorm is expected to continue into Valentine's Day tomorrow.